Introducing a podcast designed to provide Privacy and Security compliance information but also with a few my odd perspectives thrown in there. 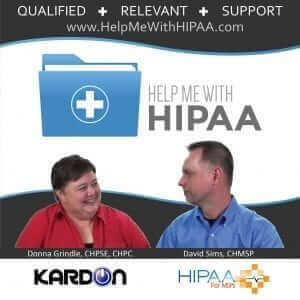 The Help Me With HIPAA podcast features yours truly and David Sims, founder of HIPAAforMSPs.com. David has his own quirks and odd perspectives to throw into the mix. We hope you will learn a little something while you hang out with us for a few minutes each week. The weekly format provides a regular source of information with a light-hearted, real-world conversational approach to learning. The episodes are 30-40 minutes so it won’t take up too much of your time – listen in the car even. Subscribe to the Podcast with any podcasting app on iOS, Android, or other smartphone or tablet. Or listen via iTunes or directly on our website from your computer. Some Android free apps include Podcast Addict and the Podcast Republic. iOS includes a built-in Podcast app. If you want to learn more about podcasting itself check out Podcasts? Don’t be afraid. Here are links for the Help Me With HIPAA podcast on iTunes and Help Me With HIPAA website. Don’t worry, this blog will continue but since it has been delayed so often this year due to my issues something new was needed. The podcast seemed like a great way to fill the gaps the blog may have and provide a new tool for those who prefer to listen rather than read. Oh, to answer the often asked question….. Yes, I have tried many different dictation tools. Unfortunately, I can not find one that has a combined dictionary for medical, security, privacy, programming, technology support, random odd thoughts, etc that I use in my posts and other work. It’s even harder to find one that has all of that in one dictionary with training for my southern drawl! While Siri and others try very hard to make me happy we often just end up in an argument and no work getting done.